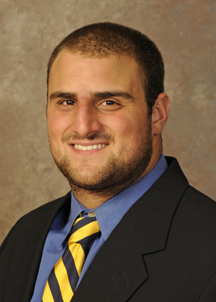 What you need to know about him: Gino Gradkowski, a 23-year-old native of Pittsburgh, is 6-feet and 300 pounds. He starred at Delaware, where he was a two-time All-Colonial Athletic Association selection after transferring from West Virginia, where he spent his first two seasons. He left West Virginia because he wanted more playing time. Gradkowski is pretty agile for a big man, as he ran the 40-yard dash in 5.25 seconds and powered through 29 reps on the 225-pound bench press at Delaware’s pro day. Why the Ravens picked him in the fourth round, No. 98 overall: Because 35-year-old center Matt Birk can’t play forever. The Ravens signed Birk to a three-year-deal during the offseason. But Birk hasn’t made the Pro Bowl since 2007 and is in the twilight of a career that began with him snapping balls to Randall Cunningham in Minnesota in 1998. Cause for concern: Gradkowski played at Delaware, which is a Football Championship Subdivision school, which is one level lower than major-college football. But the last time the Ravens drafted a player from Delaware, they did pretty well, considering he was named Joe Flacco. Flacco, like Gradkowski, started at a major college – Pittsburgh – before transferring to Delaware. Significance of his selection: The Ravens have to believe Gradkowski is their center of the future. Expect Gradkowski to back up Birk this season, when he’ll also compete with second-year player Jah Reid and rookie Kelechi Osemele to earn the starting job at left guard, which was vacated by Pro Bowler Ben Grubbs. Grubbs signed a five-year, $36 million deal with $16 million guaranteed with the Saints. The selection also speaks volumes about Gradkowski, who was the second center drafted, behind Wisonsin’s Peter Konz, who was taken by the Falcons five picks earlier. Crystal ball: The Ravens have a solid track record of developing linemen, as Grubbs and former C Jason Brown, who both signed huge free-agent deals with other teams after being drafted by the Ravens. This pick will be judged in a few years if Gradkowski becomes a mainstay in the starting lineup. It’s doubtful the selections of Reid last year and Osemele and Gradkowski will all be deemed a success since it’s hard to imagine all three being consistent starters in Baltimore. Did you know: Gradkowski is the younger brother of Cincinnati Bengals quarterback Bruce Gradkowski, who is entering his seventh year in the league.